At West Coast Solar, we believe renewable energy is the future of efficient, effective, and responsible energy consumption. That’s why in this blog series, we’re going to discuss smart grids, how they affect your energy use, what you can do to take advantage of them (if they are implemented in your area), and why they are important to the future of energy use. We’ll touch on topics like smart homes, smart cars, solar power systems, and the management of energy via a smart grid with an emphasis how upgrading our 100-year-old electrical grids and systems can improve our energy consumption. There’s more to energy consumption than turning on a light switch, pressing the “power” button on your remote, or starting your dishwasher. A complex system allows for strings of communication to take place to deliver energy to your electrical panel and into your home. This is why we want you to understand “smart” energy better, so the investment in renewable energy makes more sense to you. When you see your utility bill, you don’t have to feel like a victim anymore. The ever-rising energy prices in California no longer have to be the bane of your existence as a homeowner. You can choose to go green. You have the power to make the switch to renewable energy sources. You can choose a different future for your energy consumption and how you affect the environment. If you’re ready to discuss how you can benefit from installing a solar power system on your home or your business, give us a call today. Otherwise, continue reading to learn more about smart grids and how they can affect your life. A traditional energy grid constantly provides energy to a home or business. This is how the power grids for the last 100 years have functioned; it’s considered one-way communication. In general, this traditional system works. However, as new energy technology pushes energy consumption into the future, efficiency and effectiveness of delivering power to the residential and commercial sectors around the nation is being questioned. Can we better deliver energy? How can we encourage customers to use energy during non-peak hours? What are the consequences of continuing down our current energy consumption path? These are valid questions, and a “smart” grid can answer this with an affirmative plan of action. A smart grid opens up a two-way communication between the power grid and the buildings to be powered. This means for the customer, you, that you can save money. For example, a smart grid allows for homeowners to utilize energy during non-peak hours for applications like doing laundry, heating/cooling the building, or washing the dishes. In some cases, the integration of smart technology an result in the homeowner receiving a credit from their utility service provider for using energy responsibly. How does a smart grid work? As mentioned above, a “smart” grid allows for a two-way communication to occur between the grid and the building being supplied with energy. The smart grid introduces more control to the customer, so they can manage their energy use through a variety of digital systems. As a homeowner’s power needs shift throughout the day or their energy consumption programs adjust due to peak-hours, they will begin to save money on their utilities. Similar to the internet, a smart grid offers controls, automation, computers, and ever-advancing technologies to adjust energy supplies in real time. Why is a smart grid important? Call West Coast Solar to get your solar energy system! 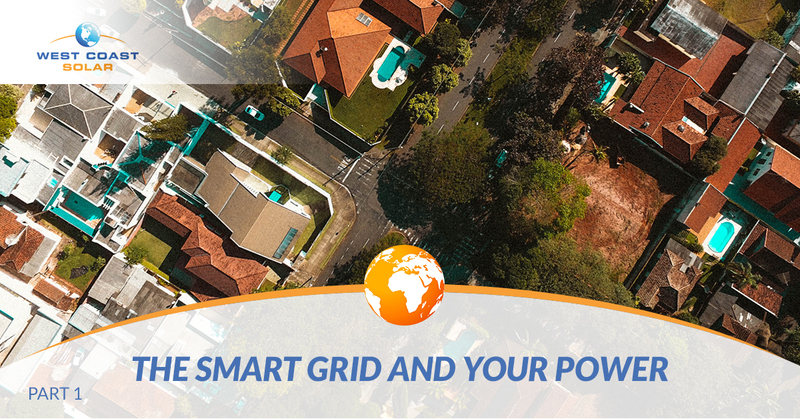 As you learn more about smart grids, consider how you can adjust your energy consumption to lower your utility bills and help the environment. One of those adjustments is to make the switch to solar power. You can install solar panels on your home or business and reap the benefits of renewable energy for years to come. You can continue reading part two of this blog series or give West Coast Solar a call today!